LONDON, September 27 (People's Net, by Wang Yisan, Bai Yang) -- The Chinese Embassy in the UK hosted a reception at the Hyde Park Mandarin Oriental Hotel, London on September 27 to celebrate the 63rd anniversary of the founding of the People's Republic of ChinaOver 400 guests, including the British Commercial Secretary to the Treasury Lord James Sassoon, other British friends of China in all walks of the society, the diplomatic officials from various countries in Britain and the representatives of the Chinese community, the Chinese students and the Chinese-funded institutions, attended the reception. 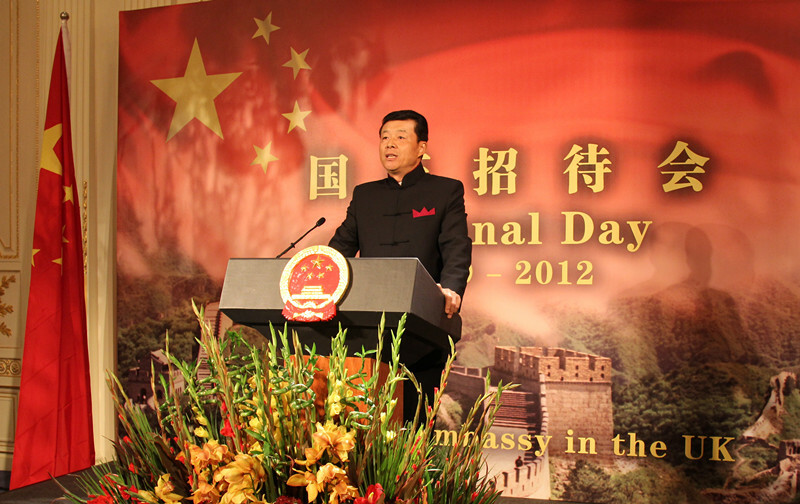 Ambassador Liu Xiaoming said in his speech that 63 years ago, the Chinese people ushered in a new era in history. They had a glorious dream of building an "independent, democratic, peaceful, unified and prosperous" new China. In the more than 22,000 days and nights ever since, the 1.3 billion people have been working hard together and brought profound changes to China. China has created a "miracle of the world" with its rapid growth for 30 consecutive years and has become the world's second largest economy and trading nation. Ambassador Liu said that today, China is at an important juncture. On one hand, the country inherits the splendid achievements of the reform and opening up. On the other hand, it also faces the opportunities and challenges of a new period. China will speed up in reorienting its growth model, further intensify its reform efforts and adhere to open and peaceful development. Lord James Sassoon, the British Commercial Secretary to the Treasury, congratulated the Chinese people on the 63rd anniversary of the foundering of the People's Republic of China on behalf of the British government. He highly praised China's brilliant achievements since its reform and opening up and recognized the fruitful results of the cooperation and exchanges in various fields during the 40 years since the establishment of the ambassadorial diplomatic relations between China and the UK. Lord Sassoon spoke highly of the major progress in the China-UK relations in recent years and looked ahead on the broad prospect of the bilateral relations.